Rosedanie Cadet is a women of Haitian decent who spent her early years in her home country. She now lives and works on Orcas Island. She reconnected with her family in Haiti just before the January 12th earthquake. While there she was both overwhelmed by the needs of the people and inspired to share with them the benefits of her education and life experience. She returned to Orcas the day before the quake with plans to help them increase food production, to help build a tuition-free school, and to create a flexible organization which would enlist local people in improving their lives. She has named that organization Noramise after her grandmother. The execution of those plans has now become a driving force for her and for the many people in our community and elsewhere. Her family connections in Limbé have given her the opportunity for grassroots help. Her uncle, cousins, and many other members of the extended family are energized and are carrying on the wheels she and the team began. They need our help. 1. Development of a municipal solid waste management system. 2. Development of an aquaculture farm for growing tilapia to help remedy the protein-deficient diet. 3. Development of farm and garden sites (some commercial) with the emphasis on Permaculture. 4. The first Orcas-Limbé student exchange to take place 20-30 of June at a summer camp held on the grounds of land in Limbé which has been dedicated for the construction of a tuition-free school. Money for equipment rental, hand tools, respirators, seeds, fish, plant stock, art supplies, sports equipment, and books. A copy of Quickbooks for non-profits. A Saint to lead the way through the process of establishing a non-profit. 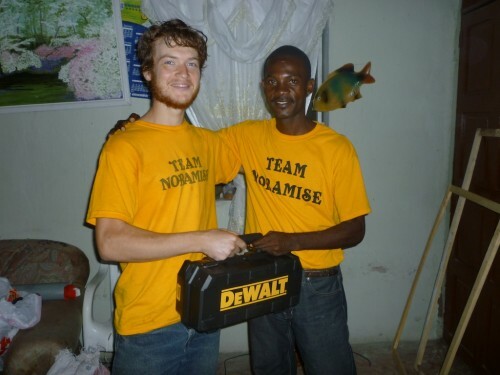 Tobias delivering metal grinder to Youth leader and iron worker Daniel. We so often hear about people and countries in need, but we don’t know where or how to begin to help. Noramise gives us the opportunity to participate in projects which will change lives and with which we can have a very direct connection. Please join us in this exciting effort. We will keep you posted every step of the way.